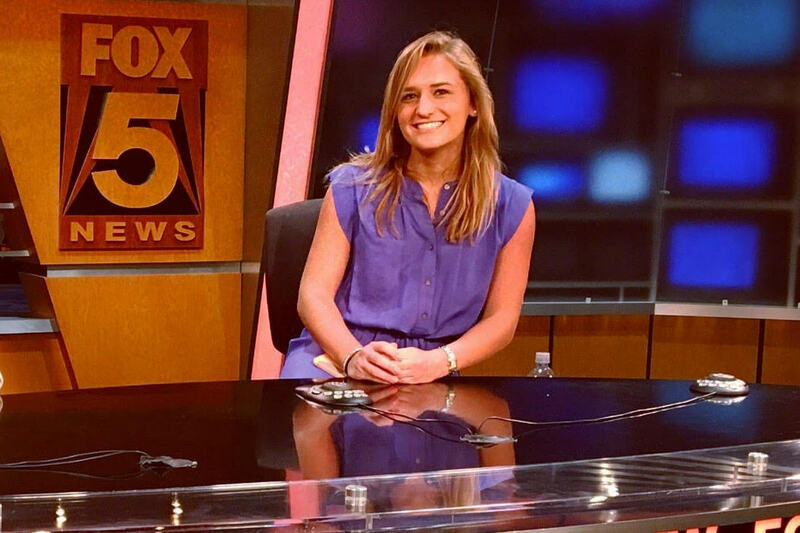 Political science and film, television, and theatre major Sydney DeVoe on the set of Fox 5 News in New York City. When Sydney DeVoe came to Notre Dame, she was convinced she would be pursuing a career in broadcast journalism. But after four years and seven internships, DeVoe realized her political science and film, television, and theatre majors provided her with more career options than she originally thought. In addition to providing a plethora of opportunities outside the classroom, DeVoe has found that her majors complement each other and work together to deepen her learning. After various, wide-ranging internships at 21st Century Fox — focused on production, editing, marketing, finance, and legal work — and a valuable experience working in London with a Member of Parliament her junior year, DeVoe is encountering a problem that many students may envy. She has too many career paths she could pursue after graduation. Each experience has either led her rule out certain paths or add another possible trajectory to the list. DeVoe’s first internship occurred the summer after her freshman year, when she worked for Blue Sky Studios, an animation studio of 21st Century Fox. The rotational internship included roles in the story, design, marketing, finance, and human resources departments. 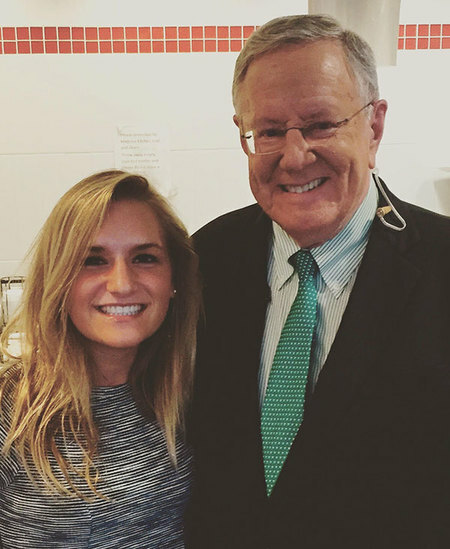 DeVoe with businessman and TV personality Steve Forbes during her internship with Fox Business Channel. The following summer, DeVoe was a production intern for the Fox Business Channel program After the Bell in New York City. There, DeVoe had the chance to pitch stories and write segments for the program, learning a lot along the way. But despite her progress throughout the summer, which led to her writing and producing her own segment, she left realizing that she didn’t want to pursue broadcast journalism. Entering her junior year, DeVoe was asked to be a teaching assistant for a first-year American politics class, a role that taught her a valuable lesson. That spring, DeVoe accepted an internship at Parliament while studying abroad in London — an experience that opened her eyes to a whole new career path. “I had never thought about working in government, but that’s something that I’m now really considering because I loved working in Parliament,” she said. DeVoe attributed her success in her Parliament internship to the writing and research skills she learned in her Arts and Letters classes. For one project, DeVoe co-wrote a speech for MP Nigel Huddleston that ended up formulating a debate a week later. 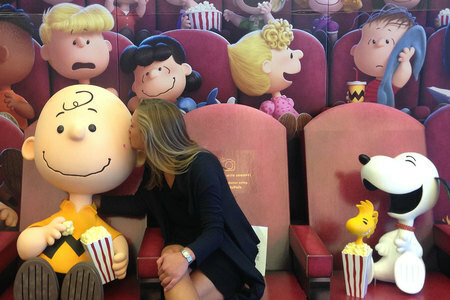 DeVoe with a promotional display for The Peanuts Movie, produced by Blue Sky Studios, where she was part of a rotational internship program. After DeVoe’s success at Parliament, she started toying with the idea of attending law school. The summer before her senior year, she explored this further with an internship in the corporate legal department of 21st Century Fox. Looking back on her first year when she thought she had it all figured out, DeVoe knows she has come a long way. And while her future is more uncertain these days, that uncertainty isn’t scary. It’s exciting. Originally published by Teagan Dillon at al.nd.edu on May 30, 2018.